Currently causing a sensation at the IAA: Mission E and the new 911 Carrera. Take a close look at the new Porsche products – with this 360-degree video. The sports car of today meets the sports car of tomorrow. What unites Mission E and the 911 Carrera: outstanding sporting performance with the maximum possible efficiency. And a unique design of course. 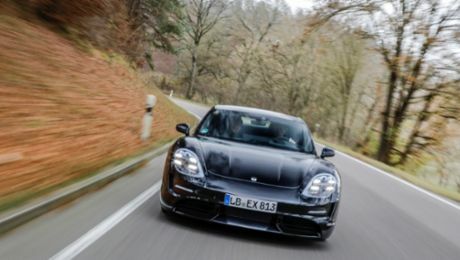 This is the second encounter for rally legend Walter Röhrl and the Porsche Taycan. The verdict is clear. Taycan: What the name of the first fully electric Porsche means—and how it came to be. The 911 is the world's best-selling sports car. The new generation has arrived.